I’m not crazy about pumpkin spice lattes. Sometimes it seems like I’m the only person on the planet that feels that way. Everybody keeps talking about how THEY’RE HERE! Have you had one yet this year? Look, you can make them at home! I actually wish I liked them so I could feel like one of the cool kids. But just because I don’t like vegetables in my coffee doesn’t mean I’m a pumpkin hater. Pie? Yes, please. Pretty much any other pumpkin dessert known to man? I’m in. I definitely love me some pumpkin, as long as it stays out of my mug. I’m also all for having one to put under my coffee. You too? Let me help you make that happen! Layer the pumpkin batting, InsulBright, one fabric right side up and the last fabric right side down. Pin in place and stitch around, 1/4” from the edge, leaving 4 1/2” open at the center top. Clip the corners. Turn right side out. Press, turning in the opening. Set aside. 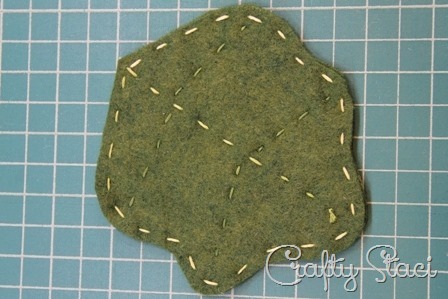 Pin the burlap stem pieces together and stitch 1/4” from the edge with a small stitch. There’s no need to sew across the bottom. Pull the loose threads away from the stitching so they’re straight out from the stem. Trim the threads so they’re fairly even. Or leave them if you like the pumpkin bedhead look. Slide the bottom of the stem into the opening at the top of the pumpkin, about 1/4”. Stitch all the way around the pumpkin near the edge. 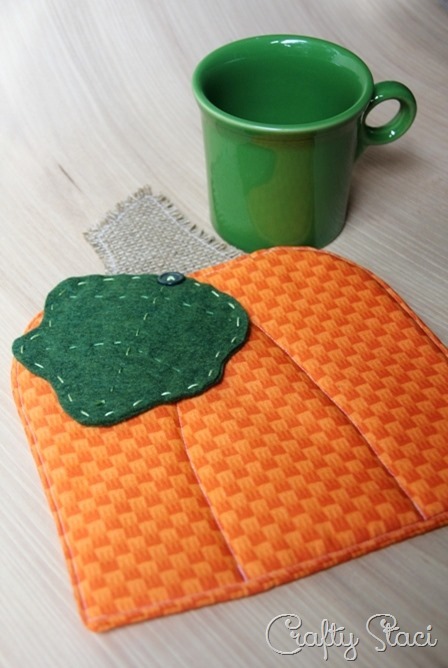 Add 2 – 4 rows of stitching from the middle of the top to the bottom edge of the pumpkin. Curve the stitching to follow the shape. Stack the two felt leaves together. Add stitches with the craft thread as shown on the pattern and around the outer edge. I didn’t notice until I was going through these photos that one of my craft thread knots is on the front. Whoops. Place the leaf on top of the pumpkin near the stem, as shown. Stitch through the button, leaf and pumpkin to hold it in place. What’s missing from this photo? That’s right, a nice chunk of pumpkin dessert. Dealer’s choice.